Pull tab for easy removal. Works in the 12 volt DC accessory outlet. We pride ourselves on our reputation for ensuring all orders are quickly processed and despatched. We will advise which is applicable. Plus, Power Jolt Dual gives you an open USB port. Attached 3-foot (0.9 m) cable with Lightning connector for iPhone, iPad, and iPod touch. Max rate charging for two devices simultaneously. DUAL PORT USB 12V (5V OUTPUT). Buy one, get one at. - Cable is not included. • Compatible with the following Bush phones: Universal. Powers up any smartphone, tablet or USB device. • Compatible with the following tablets: Universal. • Compatible with the following Alba phones: Universal. Attached 3-foot (0.9 m) cable with Lightning connector for iPhone, iPad, and iPod touch. As subject to conditions. Connected 365 are owned and operated by LDC Trading Ltd, incorporated under England & Wales number 10402281. The price is for one battery only. Ex store display item. Box/pack slightly turn but item is new and unused. 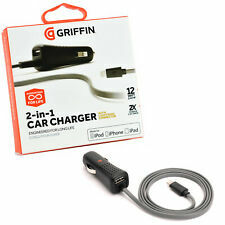 This is an buy it now listing for a Griffin Ultra Compact Car Charger and Cable. Note that this works with iPhones and iPod with the Lightning pin connector. Item is in excellent condition including 0.9m lighting to USB cable, manual and original packaging and box. Buy with confidence. 100% Feedback. Goods will be posted within 3 working days of payment. Cash on collection is also an option. Item will be posted by Royal Mail 1st Class PLEASE NOTE THAT I POST TO THE U.K ONLY. Happy buying! 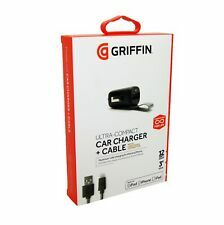 GRIFFIN RESERVE POWER BANK 10000 mAh 36Wh BRAND NEW SEALED. Condition is New. Dispatched with eBay delivery – Shutl 2-3 days. Ex store display item, please beware that the package/box is torn as shown in the picture but item is new. Description For smartphones, tablets, MP3 players and other devices that get their power through USB. Plug your device's USB cable in and charge from almost any vehicle's 12 volt accessory outlet with this low-profile, micro form-factor PowerJolt. Features: ---Works in your vehicle's 12 volt power outlet ---Charge 2 USB devices at the same time ---Smart Fuse circuit-breaker protection means no fuses to replace ---Super-compact form factor ---5 watts per port (5 volts @ 1 amp). NEW AND SEALED GRIFFIN 4000mAH RESERVE POWER BANK. Condition is New. Dispatched with eBay delivery – Shutl 2-3 days. Max-rate, safe 12W for Ipad,Iphone, Smartphone or tablets. Compatible with Apple Lightning. 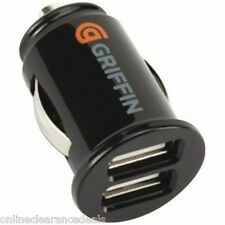 Griffin 4.8 Amp 3 Port Car Charger. Condition is New. Dispatched with Royal Mail 1st Class. Description ---For smartphones, tablets, MP3 players and other devices that get their power through USB. ---Plug your device's USB cable in and charge from almost any vehicle's 12-volt accessory outlet with this low-profile, micro form-factor PowerJolt. 1 x USB-A To Micro USB Cable. And at 2,600 milliamp Hours of capacity, this is the one power bank you need to venture far, far off the beaten path. 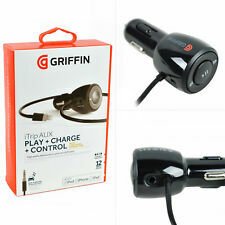 Griffin Power Jolt Dual Car Charger. Charges two USB devices. Used only a few times. Surplus to requirements. It plugs into the 12 volt power outlet in your car dashboard or console. It's a fantastic addition to an iPod or iPhone or iPod, you'll no longer have to look down to touch the face of your device. The AutoPilot also includes a line-level output jack to send the best sound from your iPhone or iPod to the AUX-in jack on your car stereo. 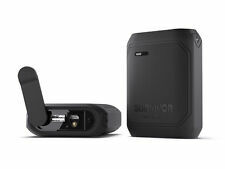 Griffin Reserve Powerbank 10000 mAh Black NEW. Condition is New. Dispatched with eBay delivery – Shutl 2-3 days. 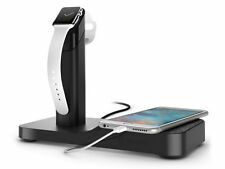 Griffin Qi PowerBlock Wireless Charging Pad. Compatible with Any Qi-Enabled Device – PowerBlock Wireless Charging Pad features the universal Qi wireless charging standard. Qi Certified wireless output up to 15 watts. This will provide you with a proof of receipt. Each port gives out 5 Watt 1A. Choose the setting that produces the strongest signal and clearest sound with your stereo system.